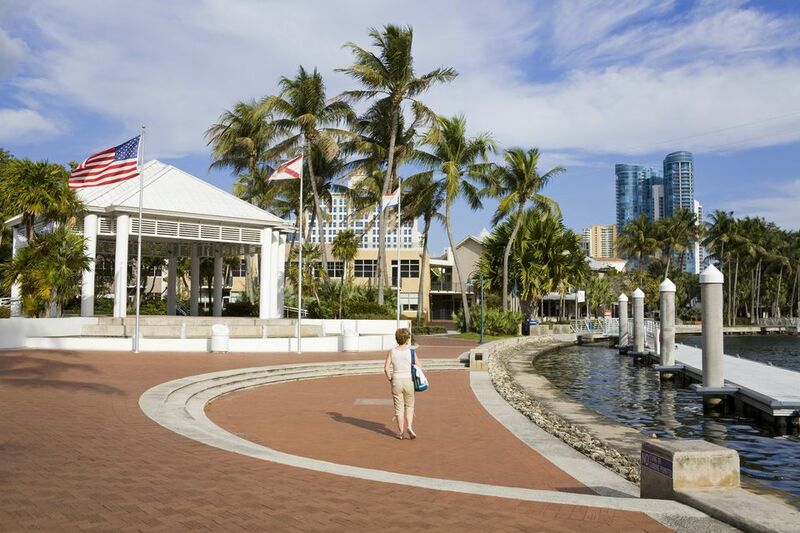 Fort Lauderdale, Florida offers exciting activities and attractions. Explore nature at the Everglades National Park or see the flamingos at a nature preserve. Top your days off with a Broadway show or concert, and you will make memories whether visiting with friends or with your family. Fort Lauderdale lies 28 miles north of Miami on Florida's Atlantic coast and is the county seat of Broward County. Fort Lauderdale's beaches offer crystal-clear water, beautiful white sand and great weather year-round! You'll probably find the beaches of Fort Lauderdale a little tamer than South Beach but just as much fun for the family. And, sunrise at a Fort Lauderdale beach is a spectacle to remember. Fort Lauderdale is home to certified Blue Wave Beaches —clean and safe—such as Hollywood, Dania Beach, Deerfield Beach, Pompano Beach, Lauderdale-by-the-Sea and Fort Lauderdale. These beaches have been continuously certified as Blue Wave Beaches by the Clean Beaches Council of Washington, D.C. since 1999. There are 23 miles of coastline from Hallandale Beach in the south to Deerfield Beach in the north and, along that coast, beach towns, each with their own unique character. With 1.5 million acres of swamps, saw-grass prairies, and sub-tropical jungles, Everglades National Park is one of the most unusual public parks in the United States. Located on the southern tip of Florida, the park is home to 14 rare and endangered species, including the American Crocodile, the Florida Panther, and the West Indian Manatee. A large portion of the park is primitive, explored only by adventurists and researchers, but visitors have ample opportunity to walk, camp, and canoe. You can glide over the Everglade's Florida Bay by tour boat or kayak for a chance to glimpse a crocodile, manatee, or dolphin. Your kids will love Fort Lauderdale's Museum of Discovery and Science. You're bound to find an age-appropriate learning adventure for every member of the family. The museum is home to over 200 exhibits including a large living coral reef, bats, snakes, the "Runways to Rockets" aerospace exhibit, and an IMAX theater. Several North American river otters can be seen from underwater and above ground viewing platforms. There are aquariums for Florida marine species such as nurse sharks and grouper fish. This large museum will keep the family engaged for hours. Butterfly World offers visitors a fun, educational opportunity to get a close-up look at beautiful butterflies at this 10-acre farm and research facility. In addition to being the birthplace of over a million butterflies, Butterfly World features the largest free-flight hummingbird aviary in the United States. Butterfly World is located in Tradewinds Park, Coconut Creek and is the largest butterfly park in the world. Flamingo Gardens is a 60-acre garden and sanctuary that showcases the natural beauty of the Florida Everglades. It features native, rare and exotic plants and animals. You can also tour a working citrus grove, visit the free-flight aviary, or visit the sanctuary, home to the largest collection of Florida native wildlife- including alligators, bear, bobcats, eagles, otters, panthers, peacocks, and flamingos. The Wray Home at the gardens was built as a weekend residence and is the oldest residence in Broward County west of University Drive. It has been restored to provide visitors a glimpse of life in South Florida in the 1930s. The Secret Woods Nature Center is one of South Florida's secret gems. This 57-acre preserve is part of the Broward County Parks system and is located in Dania Beach, just a half mile west of I-95 exit 25. Secret Woods features a 3,800 square foot walk-through butterfly preserve, two nature trails and an interpretive center. It's a great place to visit with or without children and reconnect with the natural beauty of South Florida. The Buehler Planetarium and Observatory tucked away on the campus of Broward Community College in Davie, is a small, but wonderful attraction for science lovers. The 40-foot domed theater is the only public planetarium in Broward County. You'll rarely find a crowd at the Buehler, allowing you to benefit from the knowledge and attention of the educated staff. Hours are very limited, so check their website in advance for show times and public observatory hours. Gulfstream Park is one of the state's approved "racinos" offering a combination of thoroughbred horse racing and casino gaming. If you're the gambling type, or you just enjoy horse races, Gulfstream Park a great place to spend a day. There are 20 restaurants at the park and The Village at Gulfstream Park. The village has an open-air mall which includes signature home stores, an international array of restaurants, world-class art galleries, a bowling alley, outdoor cafes and nightclubs, fashion boutiques, and health and beauty services. They have a calendar of events including live music, kid-friendly activities, and in-store classes and workshops. The Broward Center for the Performing Arts (BCPA) is one of South Florida's premier entertainment venues. BCPA features musical entertainment, theater, and other special events. This large multi-venue performing arts center theater and entertainment complex is located in the heart of downtown Fort Lauderdale. They feature Broadway musicals, ballet and big-name entertainers in concert.